It must be a sign of my age, but I find myself seeking out ‘sure things’, ‘guarantees’, safety and avoiding risk – not only in my purchases, holidays, choices of pizza toppings, but also in choosing what to spend my spare time on. One thing I know without a shadow of doubt, is that any production by The Mischief Theatre is going to be hilarious, witty, silly and brilliant and will be the best 2 hours spent of many a week. 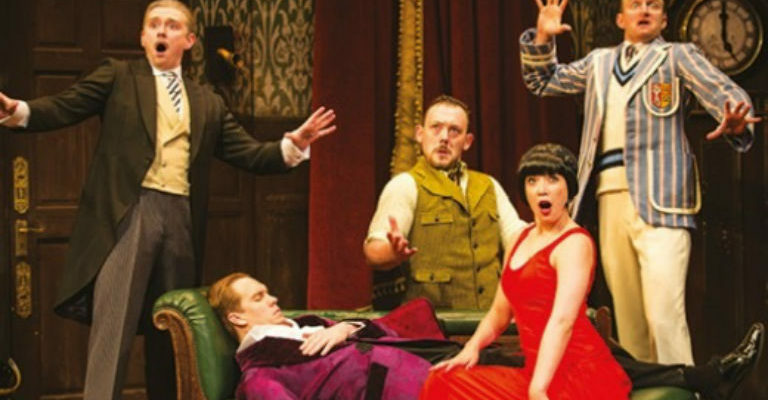 This tour of their West End & Broadway smash, The Play That Goes Wrong (a show I first saw 4 years ago and have plagued friends & family about it ever since) is their take on the eponymous Cornley Polytechnic Drama Society’s murder mystery. Made possible by a generous legacy from Claude Bennett (which is possibly why his nephew features in the show in a number of roles), this play explores the whodunnits of old, set in stately Haversham Manor with plot and counterplot to rival any Agatha Christie tale. Sadly (for the Polytechnic Director, Designer, Costumer Designer, Press, Box Office Manager, Dramaturgy, Voice Coach (and many more roles he has claimed for himself) Chris Bean that’s where the similarities end and instead the whole production descends into a comedy of errors beset with pratfalls, slapstick and the ultimate destroying of the set that would not be out of place in a Buster Keaton movie. The real nub of this show is that it is a play within a play; if you hadn’t already guessed, Cornley Poly are the fictitious company wonderfully directed by Mark Bell performing the brilliance of writers Henry Lewis, Jonathan Sayer and Henry Shields. The real show starts well before curtain up (so make sure you’re in your seats at least 20 mins early) as some of the stage hands and tech team begin to set up for the opening scene. From here on you know this isn’t going to be like any other show you’re likely to see, nor are you likely to laugh as hard and as loudly as you will whilst watching it. I’ll attempt to summarise (so please do try to keep up) ….. Chris Bean, played by Jake Curran, plays Inspector Carter who is drafted in when Steven Rostance as Johnathan Harris playing Charles Haversham (he of the manor) is found dead on his engagement night. Suspects for this foul deed include his brother Cecil, played by the afore mentioned Claude Bennett’s nephew Max who is actually the brilliant Bobby Hirston, Robert Grove (who is really Kazeem Tosin Amore) playing Thomas Colleymore, and his sister, Charles’ fiancé Florence, played by Elena Valentine playing Sandra Wilksinson. Okay, now breathe as there’s still more to add – the family butler, Perkins who is Dennis Tyde (but really Benjamin McMahon) tries to keep the peace between the warring factions, but constantly finds his attempts thwarted by both the props and the overly ambitious staging, not to mention the unfortunate accidents that befall most of the cast in one way or another – Elena, as Sandra, as Florence, ends up unconscious and so is replaced by stage manager Annie (Catherine Dryden) who suddenly finds that her original shyness in front of the audience has been replaced by a real calling to take centre stage. Likewise, Duran Duran fan and sound and lighting guru Trevor Watson (the hilarious Gabriel Paul) is drafted in to try and surreptitiously fix some of the calamity, only to find he too falls prey to the acting bug (and the curse of the set). The story moves along at a real pace with never a moment missed by the cast, or cast, to inject some additional action or incident. Make no mistake, this is probably the hardest technical show I’ve ever seen; to make so many mistakes and accidents look authentic and yet remain on cue and perfectly timed is sheer brilliance – people used to say of Les Dawson that he could only play the piano so badly because he could actually play it brilliantly and this show is exactly that. The set designer Nigel Hook has taken every classic joke, prop fail and pratfall and melded them into a non stop riot – sure you see some of them coming but that actually makes them even funnier because the cast apparently can’t. All too often we are served up tv comedy which consists of people trying very hard to look very clever and witty yet so much of it is Emperor’s new clothes – people laugh because they think it’s meant to be funny and therefore they need to be a part of the ‘gang’ who get the joke – forget all that false and pretentious humour and go see The Play That Goes Wrong – it is honest, genuine, and unashamedly daft yet done so brilliantly that not only will you laugh out loud, you’ll not give a damn who hears you because everyone else will be doing the same. The Play That Goes Wrong is on at Newcastle Theatre Royal 2nd – 7th July and then Billingham Forum 17th – 22nd September. Treat your funny muscles to a real work out and you’ll ache for days afterwards.